One of two similar package representing the type of hostile incendiary device that injured the fingers of two people in Maryland Thursday afternoon. Annapolis police and firefighters responded to two small explosions in the city just before 1:00 p.m. and 1:30 p.m. ET Thursday. Small detonation “not explosions” at two Maryland state government office buildings caused minor injuries to a person at the Jeffrey Building in Annapolis, Maryland. The injuries are reported to involve fingers. A device detonated about 1:00 p.m. at the Maryland Department of Transportation headquarters near Hanover, Maryland, and a device detonated at about 12:25 p.m. in the mailroom of a state House office building, the Jeffrey Building, in Annapolis, Maryland. Both detonations that occurred when the packages were opened, involved a small flash, small amount of fire, smoke and a sulfur smell. Sulfur is similar to the smell immediately after the striking of a match. No property damage has occurred. No explosive material has been found at the early stage of the investigation. Both buildings were evacuated (50 people evacuated from Jeffrey Building and 250 from DOT building) and security precautions were being taken in state buildings and city buildings. Employees were ordered not to open packages until dogs could sniff packages for the presence of explosives. All government mail rooms are in lock down. Employees that were evacuated from the building were allowed back in the building by 3:00 p.m. The offending mail at the Jeffrey Building 31 Francis Street was destined for the governor of Maryland, Governor O’Mally, and the governor’s mail normally arrives at the Jeffrey Building. 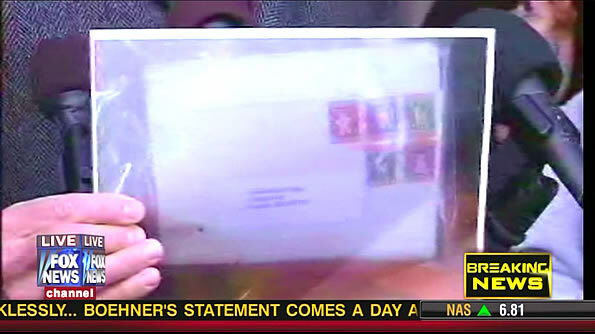 Christmas stamps were affixed to the package. The second package was addressed to the Maryland Department of Transportation via the United State Postal Service. Local police bomb squad units responded, and the FBI and Maryland state bomb squad also responded to the scene immediately after the first responders. The Jeffrey Building in Annapolis houses the state Homeland Security office.